only in cinemas April 4. "Be an Xbox Gaming Super Hero" Xbox SHAZAM! contest. POSTER OR ADVERTISMENT COPY (WHERE SPACE ALLOWS): Australia. 16+, NO PURCHASE NECESSARY. Normal exclusions apply. Registration and then entry via Facebook [ www.facebook.com/xbox] using #SHAZAMXbox #Shazam. Twitter [www.twitter.com/xbox] using #SHAZAMXbox #Shazam, or Instagram [www.instagram.com/xbox] using #SHAZAMXBOX #Shazam. Write in text. Max 280 characters on Twitter, 250 words on Instagram and Facebook, ‘telling us what your best friend’s super power would be and their abilities for a chance to win.’ Contest runs March 25, 2019 – April 9, 2019. Entries will be judged against criteria and winners contacted via entry method by May 26, 2019. Prizes consist of; One (1) Top prize consisting of a skinned Xbox One X console and skinned controller for the prize winner and their chosen best friend (two (2) consoles and two (2) controllers in total). Five (5) runners up will each win a SHAZAM Tote bag and a Twelve (12) month digital code for Xbox Game Pass for the runner up and their chosen best friend (two (2) tote bags and two (2) Xbox Game Pass codes per runner up). See (Terms Link) for Full T&Cs. Promoter: Microsoft Corporation. These Terms and Conditions (the “Terms and Conditions”) prevail in the event of any conflict or inconsistency with any other communications, including advertising or Contest materials. Entry instructions are deemed to form part of these Terms and Conditions and by participating all participants will be deemed to have accepted and be bound by them. Please retain a copy for your information. 1. The “Be An Xbox Gaming Super Hero Contest” (“Contest”). Contest open to legal residents of Australia who are aged sixteen (16) or older at the time of entry. Minors must have the permission of a parent or legal guardian to enter. 2. Employees of Microsoft, Warner Bros. Entertainment Inc. or their parent, affiliates, subsidiaries, advertising or promotion agencies are not eligible, nor are members of these employees’ families (defined as parents, children, siblings, spouse and life partners, regardless of where they live) or anyone else professionally connected with this Contest. 4. Entrants must have access to the internet and an active Facebook, Twitter or Instagram account. Proof of ownership of the social media account and proof of age may be required. If you do not have a Facebook, Twitter or Instagram account, you will need to create one to participate – you will require an active email address to do this. See respective websites for how to set up an account. Entries made on Facebook, Twitter or Instagram will be subject to their respective Terms of Service which can be found on the respective online website. 5. Entrants will have to compose an answer to the question “Tell us what your best friend’s super-power is?” written in max 280 characters on Twitter, 250 words on Instagram and Facebook, to enter. (no images or videos will be accepted). 6. Maximum one entry per person ONLY throughout the duration of the Contest on one of the three detailed social media platforms. 7. No entries from agents, third parties, organised groups, syndicates or aliases will be accepted. Multiple entries from the same person beyond the limit will not be accepted (where applicable). Any persons or institutions trying to circumvent this condition by any method, including but not limited to using multiple or alias Facebook, Twitter or Instagram accounts, will be disqualified along with all entries from associated accounts. Only genuine valid entries will be considered. 8. The genuine entrant is defined as the individual who has submitted the response on their respective Facebook, Twitter or Instagram account. a. Either log in as an existing Facebook member or sign up for free at Facebook.com. b. Entries only from public accounts will be accepted. To enter from a private account, you must amend your account settings to a public account in order for the entry to be accepted. c. Look out for the following Contest post on or after March 25, 2019. “What super power would your best friend have?" d. Locate the Contest post and share the post, submitting your answer in the shared post (in text only form) telling us ‘What superpower would your best friend have and what would their abilities be?’ in less than 250 words. a. Either log in as an existing Twitter member or sign up for free at Twitter.com. 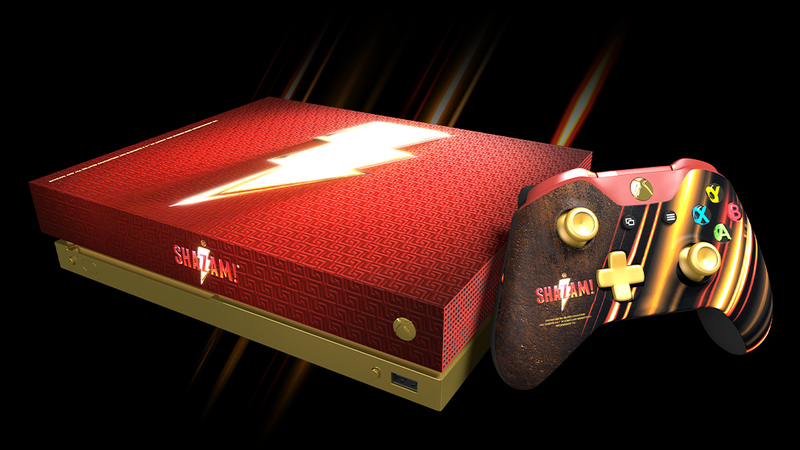 Retweet this and tell us their ability in your post, and you could both win a custom console inspired by #Shazam, only in theatres April 5. #ShazamXbox. Canada, 16+, closes April 9, 2019 T&Cs apply see www.xbox.com/shazam. d. Locate the Contest post, retweet the post submitting your answer within the retweet (in text only form) telling us ‘Which super power would your best friend have and what would their abilities be?’ in less than 280 characters. a. Either log in as an existing Instagram member or sign up for free at Instagram.com. d. Locate the Contest post submit your answer as a comment (in text only form) telling us ‘Which super power would your best friend have and what would their abilities be?’ under the Contest post in less than 250 words. 11. The written responses to the Contest entry requirements “Contest for a chance to win, by telling us what super power your best friend would have and what their abilities would be” must be original, created and composed by the entrant and cannot infringe the copyright or other intellectual property rights of any third party. Any response found to be copied, doctored or amended or plagiarised will be disqualified. 12. The written response must be unique for this Contest and cannot be a re-use of work entered in any other writing competition. 13. Obscene or inappropriate entries will not be accepted. Entrants are solely responsible for the information they provide and views they express in the written response. o Elements that are known to be false, inaccurate or misleading. o Uses names or characters whose permission has not been granted. o Contains references to Individuals smoking tobacco, drinking or appearing to be under the influence of alcohol. o The depictions of individuals’ or companies’ names, phone numbers, email or postal addresses, website or social media sites or any other personal information deemed sensitive, private and/or unacceptable by the Promoter. o Any computer viruses, worms, Trojan horses or other potentially damaging computer programs or files. 15. The Promoter reserves the right at its sole and absolute discretion to permanently remove any material that is deemed to be distasteful, degrading or will in any way cause offence and if necessary, report to the appropriate authorities. 16. Anyone, who in the Promoter’s absolute discretion, is acting in a manner that undermines the operation and integrity of the Contest or in any way that gives an unfair advantage, will be disqualified and any persons seeking to use such information gained will be disqualified. 17. The Promoter does not guarantee that you will have any recourse to edit or delete any Content you have submitted. The Promoter has the right to remove or refuse to post any entry for any reason. You acknowledge that you, not the Promoter, are responsible for the Contents of your submission. None of the Content that you submit shall be subject to any obligation of confidence on the part of the Promoter, its agents, subsidiaries, affiliates, or third-party service providers and their respective directors, officers and employees. 18. Entrants warrant that their entry is their original work, has not been copied from others. 19. The Contest opens on Thursday March 28, 2019, at 14.01 and ends on Wednesday April 10, 2019, at 13.59 (The “Promotional Period”). 20. Entries submitted outside these Contest dates and times will not be included in the Contest. 21. Throughout the Contest and at the Contest close date, all valid entries will have been judged by a panel of judges, one independent of the Contest, to deliver a shortlist from which the top 6 will be determined. - One (1) Top prize consisting two (2) skinned Xbox One X consoles and two (2) skinned controllers for the prize winner and their chosen best friend (two (2) consoles and two (2) controllers in total). - Five (5) runners up will each win a SHAZAM Tote bag and a twelve (12) month digital code for Xbox Game Pass for the runner up and their chosen best friend (two (2) tote bags and two (2) Xbox Game Pass codes per runner up). 24. Prizes are strictly non-transferable and must not be sold, auctioned nor advertised for sale whether on the internet, in newspapers or elsewhere. Any person found in breach of this term will be disqualified from participating. No cash alternatives or other alternative prize will be available in whole or in part, except in the event of circumstances outside the reasonable control of the Promoter. Microsoft reserves the right to substitute the prizes with prizes of equal or greater value. The prize will only be awarded directly to the Winner. 26. Prizes may be considered as a taxable benefit to the winners. Winners will be directly responsible for accounting for and paying to the relevant tax authority any tax liability arising on their prize. Prize winners may be required to complete and return prize claim and / or tax forms within the deadline stated in the winner notification. Please contact a tax professional or www.irs.gov for any query related to the taxable amount for reporting to the tax authority. 27. All genuine valid entries will be judged against the stated criteria by a panel of judges from all valid entries received. 28. The judging panel will consist of a panel of judges, and one independent auditor. All judges have the experience in this type of competition and will be using the judging criteria in order to score the entries. Judging will take place using an independently verified process ensuring the process can be audited. 29. The judging will take place throughout the Contest (depending on entry numbers) and up to 23.59 on Monday April 29, 2019 with the final list of winners and runner ups being decided upon, before the end of the day on Tuesday April 30, 2019. The judges will work together, and the total process will be overseen by an independent adjudicator to ensure all acts meet the necessary, satisfactory and required standards. This process will confirm when the judging is complete the overall winner, and the rest of the prize winner. 31. Winners will be notified via direct message on the social media platform they entered on, providing them instructions for the next steps. Winners will be required to respond via Directly Messaging the Promoter within fourteen (14) days of the comment being made. 32. Entrants may be required to provide securely to the Promoter, within the specified time scales below, information including their name, a valid address, photo I.D. and any additional contact details required to assist with fulfilling the claim and arranging the prize dispatch. Inaccurate information may result in the prize being forfeited. 33. The Promoter will make reasonable efforts to contact the winners and then, after successful contact, to receive information to allow fulfilment of the claim and arranging the prize dispatch. However, if the Promoter is unable to contact a winner or if the winner has not responded to notification after 14 days, or if a selected winner is ineligible, otherwise in breach of these terms and conditions, or unable to take up the prize for any other reason, the Promoter reserves the right to withdraw the prize. The Promoter reserves the right to award the prize to a reserve winner who is next ranked from the original Contest. 34. All prizes will be sent via international signed delivery no later than 30 days after the winners have been selected by Microsoft, and no later than 30th May 2019. 35. The Contest is in no way sponsored, endorsed or administered by, or associated with Facebook, Twitter or Instagram. Any information you provide as part of this Contest is provided to the Promoter and not to Facebook, Twitter or Instagram. Entrants to this Contest hereby release Facebook, Twitter or Instagram from any claim or liability suffered in connection with this Contest. 36. Each major winner consents to his/her surname and his/her country of residence being made publicly available together with their winning entry upon request. Major Winner’s names and entries will be available for a period of 28 days after the selection of winners by submitting an email to winners@winnerslists.com with the subject line of Xbox Super Heroes USA. 37. Participants may be required to take part in reasonable publicity relating to this Contest without further remuneration, unless prohibited by law. 38. The contents of all entries submitted become property of the Promoter. The Promoter reserves the right to use the contents of entry submissions provided by entrants, for editorial, advertising, marketing and promotional purposes, without further compensation or notice, unless prohibited by law. Each Eligible entrant grants permission for Promoter to use the contents of his/her entry submission for editorial, advertising, marketing and promotional purposes in any and all media now known or hereafter discovered, worldwide, in perpetuity, without compensation, notification or permission. Participants agree not to assert any moral rights in relation to such use where the moral rights in respect of the content, are theirs to assert. Participants warrant that the materials contain no copyright materials, are their original works, have not been copied, in whole or in part, from any third party and they have full authority to grant these rights. 39. No correspondence will be entered into regarding either this Contest or these Terms and Conditions. In the unlikely event of a dispute, Microsoft’s decision shall be final. In the event of circumstances outside the reasonable control of Microsoft, or otherwise where fraud, abuse, and/or human error affects or could affect the proper operation of this promotion or the awarding of prizes, and only where circumstances make his unavoidable, Microsoft reserves the right to amend, modify, cancel or withdraw this promotion at any time, but will always endeavour to minimise the effect to participants in order to avoid undue disappointment. 40. Participants in this promotion agree that Microsoft will have no liability whatsoever for any injuries, costs, damage, disappointment or losses of any kind resulting in whole or in part, directly or indirectly from acceptance, misuse or use of a prize, or from participation in this promotion. Nothing in this clause shall limit Microsoft’s liability in respect of death or personal injury arising out of its own negligence or liability arising out of Microsoft’s fraud. 41. The Promoter may at its absolute discretion disqualify any participant found to be tampering with the application process or operation of the website or found to be acting in any manner disruptive to the Contest. Any person posting, or seen to be posting, comments during the promotion that are considered bullying, spiteful or upsetting to other participants, associates or directly aimed at the Promoter, will have their comments removed and will be disqualified from the promotion. 42. Microsoft cannot guarantee the performance of any third party and shall not be liable for any act or default by a third party. 43. Sometimes, through reasons outside of the Promoter’s control, the website or social media platform (as with any website) may not be accessible. The Promoter cannot guarantee continuous, uninterrupted access to the website. No responsibility will be accepted for any difficulties in entering, claiming or any entries/claims delayed or corrupted. The Promoter will have no liability for any loss arising out of such an event. 44. If an entrant attempts to compromise the integrity or the legitimate operation of this Contest by hacking or by cheating or committing fraud in any way, the Promoter may seek damages from that entrant to the fullest extent permitted by law. Further, the Promoter will disqualify that entrant’s entry to this Contest and may ban the entrant from participating in any of our future promotions. 46. These Terms and Conditions (and any non-contractual) disputes/claims which arise out of or in connection with them) will be governed by the relevant local law, and dispute or clarity will be submitted to the exclusive jurisdiction of the courts of the United States. 47. Personal Data will be handled in accordance with each individual markets data protection code of practice and local legislation. 48. Warner Bros. Entertainment Inc. and its parent, affiliates and subsidiaries are not responsible for the promotion, administration or execution of this promotion. 49. SHAZAM! AND ALL RELATED CHARACTERS AND ELEMENTS © & ™ DC COMICS AND WARNER BROS. ENTERTAINMENT INC.